This low fat recipe dates back to March 2001 and Ive been cooking it ever since then! 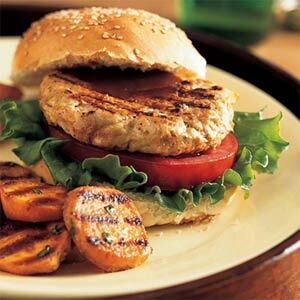 This is one of my favorite Turkey Burger recipes of all time. This is a recipe I think youll love for many years to come and you can feel good about eating it too! Ground turkey, by nature, can be somewhat dry because of its lack of fat. The added zucchini and carrot not only give it a boost of flavor, but they add much needed moisture and vitamins. Seriously, this is the key to keeping it low fat and still having a moist burger. I know you wont be disappointed. Combine the onion, carrot, zucchini, 2 tablespoons barbecue sauce, breadcrumbs, and the next 5 ingredients (breadcrumbs through turkey) in a medium bowl. Divide turkey mixture into 4 equal portions, shaping each into a 1 1/2 inch-thick patty. Heat a grill pan coated with cooking spray over medium-high heat. Place patties in pan; cook 7 minutes on each side or until done. Place 1 lettuce leaf, 1 tomato slice, and 1 patty on the bottom half of each bun. Spread each patty with 1 1/2 teaspoons barbecue sauce. Cover with top halves of buns. I use this as the foundation of my bbq turkey burgers, but I take poetic license to add whatever flavors Im in the mood for. Im a spicy kinda gal, so quite often Ill add diced jalapenos and some Mexican seasonings; or if Im looking for an Italian flavor, Ill add Italian seasonings and sun-dried tomatoes (and maybe even some low fat feta cheese). Experiment and let me know what kinds of flavors you come up with. What do you like to put on your turkey burgers? How creative can you get with your flavors? Low fat is anything but boring! 6 Comments on "LOW FAT BARBECUE TURKEY BURGERS Less than 22% Fat"
Turkey Burgers are a favorite in our house! I add garlic, onion, parsley, and lots of basil in our mix. I plan to try the barbeque recipe next time I make Turkey Burgers. Thank you for sharing! These grilled turkey burgers look absolutely fantastic. .-= Jack from BBQ Islandss last blog ..Barbeque Island Designs from NCAGrills.com =-. I dont see zucchini and carrot in the recipe. Did I miss something?? What a goofball I am sometimes Ath. Ive edited the recipe to include the missing ingredients. Thanks for bringing it to my attention and I hope you enjoy the turkey burgers! Theyre a fave of mine!